Hello, all! It’s been a while since I posted here and I thought I’d give an update. First up, the good stuff. Three Rocketeers nears publication. I believe it’s just waiting on final art at this point and, well, that’s pretty darn exciting. The sample are that Fred has shared is absolutely phenomenal. I can hardly believe someone created such a beautiful drawing based on my words. Jon Favreau has matured as a writer and film maker over the last twenty years. Swingers was a catchy, silly comedy of its time that tapped into the ennui of Generation X. Zathura was a visual delight and enchanting tale of childhood. Iron Man and Iron Man 2 were unqualified box office smashes and catapulted Marvel studios into the juggernaut it is today as well as showing that Favreau can handle a film with a larger scope. His latest film, Chef, is an intensely personal exploration of relationships, passion, art, and the human spirit in the digital era. The titular chef, Carl Casper, played by Favreau, was once the rising star of the food scene in L.A. The relationship with his restaurateur partner (played by a deliciously aggressive Dustin Hoffman) has soured, leaving Casper hamstrung creatively and powerless in his own kitchen. Casper communicates with others through his food. Indeed, his attempts to communicate outside of the culinary medium more often than not fall flat. Carl’s muzzled creativity leaves him frustrated and unable to express himself with his ten year old son Percy and ex-wife Inez, played by Emjay Anthony and Sofia Vergara. When a Twitter feud with an online food critic spirals out of control, Carl loses his job amid videos of a very public meltdown going viral. What follows is Carl’s journey to rediscover the joy of cooking, his creative spirit, and to rebuild his broken family. It’s a fun and funny tale filled with some genuinely touching moments between Carl and Percy as they navigate the rocky waters of a divorced family. The Casper boys learn to function as father and son, perhaps for the first time. Like many Americana films, the journey isn’t just emotional but literal as the characters drive from Miami to L.A. in a food truck, stopping in cities along the way to explore the food. Apparent throughout the film is Favreau’s love of food. There are numerous montages of the chef at work, carefully crafting beautiful dishes. Favreau deftly uses Carl’s cooking to express the character’s emotions. When frustrated after a bitterly personal and negative review by the renowned food blogger, Carl spends the night in the kitchen crafting a whole new menu. He works through his frustrations the only way he knows how: by creating new foods to express himself. His sous chef Tony and line cook Martin, who seem to be Carl’s best friends, are delighted with the new food and temporarily re-invigorate Carl’s passion. When Carl finally realizes he has no control over the kitchen, he walks out of the restaurant and leaves his job behind. At home he creates the extravagant, creative meal that he wanted to give the critic. It’s an explosion of creativity from an artist who has been throttled and strangled by the man holding his leash. Early on we repeatedly see Carl trying to communicate through his cooking and failing. He’s reined in at work, prevented from making the food he wants to cook. These frustrations hurt his home life; wanting to cook better food, Carl devotes more to the restaurant than to his son. Carl wants to be a better father but can’t find the way. We watch as he lovingly prepares a perfectly browned grilled cheese at home for Percy, whose only response is, “Mom cuts off the crust.” It’s heartbreaking to watch father and son try to reach out to one another and not connect. Food is an experience that can run the emotional gamut. Carl not only cooks for his family but for his lover. One cooking montage functions as a stand in for a love scene between Carl and Molly, the hostess played by Scarlett Johansson. It’s an effective piece that says more about the characters than if they had tumbled into bed together. Watching Molly watch Carl as he prepares a dish of pasta affords us a glimpse of how a beautiful young woman might fall into an on-again, off-again affair with an overweight, middle-aged cook. Carl and Percy do eventually connect over a shared love of food and cooking. Their relationship grows and deepens as Percy learns to cook on the food truck. They understand one another when they speak the language of food. We get to see Percy try his first beignet and discover authentic Texas brisket. Along the way Carl imparts some of his philosophy on food and cooking to Percy. It’s about passion, artistic integrity, and touching other lives through food. The climax of the movie comes as the food critic, played by Oliver Platt, approaches the food truck to compliment the chef on some truly amazing food. By letting his food speak for him, Carl finally gets a glowing, personal review that his Twitter feud and incensed confrontation couldn’t net from the blogger who nearly destroyed him. Carl’s journey is complete at this point – he’s rediscovered his passion for cooking and strengthened his family along the way. It proved to be more rewarding than he could have imagined. It surprised me how much of the film is dedicated to an exploration of technology, specifically digital communication and the viral transmission of memes. While not a speculative story, I would classify Chef as science fiction. One of the many themes the film explores is the impact of technology upon society, which I consider the bedrock of science fiction. The conflict of the first act, which results in Carl’s unemployment, is an accidental Twitter feud with a food blogger. Carl’s ignorance of the digital medium is why things spiral out of control and leads to his time of crisis. Further, the public meltdown Carl has when he confronts the food blogger goes viral as a video on YouTube. This notoriety makes Carl a toxic property in the L.A. food scene, preventing him from finding another job. The message is clear: the digital era amplifies the magnitude of a message. Not only can anyone see something that is posted online, but it’s possible that everyone will see it. The internet has opened up the world. It used to be that only a select few, typically those in power, could be heard by so many. Now anyone on YouTube or Instagram can influence the masses. Carl is an artist dedicated to an ancient art. His life is firmly grounded in meatspace. It’s fitting, then, that he struggles with technology. Percy is a child of the information age and acts as the wizened old man, shepherding his father through digital travails. As Carl teaches Percy about cooking, Percy teaches Carl about social media. The kid is constantly taking photos, shooting videos, tweeting, and posting Vines. It’s the photos, videos, and Tweets that Percy posts along the way that lead to the success of the food truck. It becomes another bonding experience for the Caspers; they grow closer because technology lets them share more intimate moments than they would have without it. The benefits of technology are shown to the viewer but come with a warning to use it responsibly. It asks questions but doesn’t prescribe a solution. That’s science fiction I like. I give Chef a 4 out of 5. It’s a genuinely touching film with many small laughs and a few big ones. The journey that Carl makes, both emotionally and literally, is well told. The cast is excellent. Favreau is believable as a frustrated artist who needs to reconnect with his muse. Emjay Anthony delivers a wonderful performance as Percy, particularly considering his young age. John Leguizamo is utterly enjoyable as the rambunctious Martin. Sofia Vergara, Scarlett Johansson, Dustin Hoffman, Oliver Platt, and Bobby Cannavale are solid supporting cast members. I cherish Hoffman’s performance as a foul-mouthed, slimy, overbearing, and risk-averse restaurateur. The one performance that was jarringly out of place was Robert Downey, Jr. as Carl’s ex-wife’s ex-husband who finances the food truck. He’s completely over the top in an otherwise down to earth film. Chef uses music made famous in the cities it visits. A Cuban band plays much of Miami and the soundtrack switches to jazz in New Orleans before sliding into guitar-driven blues in Austin, TX. The overall effect makes the movie feel homey and celebratory. Here are the places we love with their unique foods and music. The film has some structural issues, the first act is overly long and the ending is a bit too twee, it never quite feels like it earns the final shot of the film. Again, I don’t think the scene with Downey, Jr. played well. But these problems are overshadowed by the sheer enjoyment of watching Favreau, Anthony, and Leguizamo drive across the country with wonder in their eyes. As you may know, I’m a bit of a Star Wars nerd. Friday morning was a more or less standard X-Wing tournament. We mustered at 9am and went five rounds until there was a single undefeated player. We were done by 6pm. Had this been a regional or store championship, we would have cut to the top 8 and played a single-elimination bracket from there. While I was up for it, the tournament was only scheduled to go until 6 p.m. I brought a completely different list to the dogfight. Last fall I had great success running an Imperial list with Soontir Fel + Push the Limit + Targeting Computer with two naked Bounty Hunter Firespray-31s. I’ve come to love the Firespray quite a bit so I put together a squad using Boba Fett and Kath Scarlet in the Scum & Villainy faction. Bringing only two ships really made me nervous but it worked out well. There’s a lot of synergy between the pilots I chose and I flew them very, very well. Boba Fett was upgraded with Veteran Instincts, Engine Upgrade, “Mangler” Cannon, Tactician, and Inertial Dampeners. Kath Scarlet was given Push the Limit, a K4 Security Droid, and a “Mangler” Cannon. The idea is that Boba can maneuver last and adjust his position to get arc dodgers like Soontir Fel into position while Kath drops strong, consistent damage every turn. Boba Fett’s Engine Upgrade lets him adjust his position with a boost action while the Inertial Dampeners let him sit tight if his opponent dropped right in his line of fire. Boba Fett also has an advantage at every range band. His pilot ability allows him to reroll one die for every enemy ship at range 1 when attacking or defending. This is in addition to having 4 attack dice at range 1. At range 2 the Tactician hands out stress to my victims and the “Mangler” Cannon turns one hit into a crit. Further, the “Mangler” Cannon denies my opponent a bonus defense die at range 3. Unless they fire back with a secondary weapon, Boba gets his bonus die on defense. Kath Scarlet’s upgrades were golden. The K4 Security Droid is the key. It lets Kath acquire a target lock whenever she makes a green maneuver. This isn’t an action, either. She can do it while stressed or even if she bumps into a ship. Push the Limit comes into play by giving Kath a focus and evade action every turn. Yes, it stresses her but it really turns her into a tank. Since she wants to make green maneuvers to trigger the K4 anyway she’s clearing stress every round, which makes Push the Limit and K4 Security Droid an amazing combination. Having both target lock and focus makes Kath’s damage incredibly consistent; and if she doesn’t spend the focus on attack, it makes her defense that much more potent. The “Mangler” Cannon was equipped mostly as anti-Interceptor hate with the critical hits and denying a range 3 bonus die. Kath’s pilot talent is also really clutch. She rolls an extra die when attacking from her rear arc. This means she’s firing 5 dice at range 1 and 4 dice at ranges 2 and 3. It’s better than a Heavy Laser Cannon. Once she gets in front of someone, their best bet is to turn tail and run away. My opening game in the dogfight was against a new player who has only been playing casually for a few months. He brought a two ship list with Han and Wedge. His enthusiasm and fandom were readily apparent and it was refreshing to have someone there simply out of a love for Star Wars. The Falcon was crewed by Lando and Chewie. How can you not love that? I almost feel bad about how badly I beat him. It was a tournament and I was playing to win. Boba and Kath focused fire on Wedge; he only got a single shot off at range 3. After that, Kath got in front of the Falcon (which wasn’t even a Fat Han) and started dumping 5 dice attacks with target lock & focus into Han’s face. Kath killed the Falcon in three rounds and Boba never even got to shoot it because he was out of position too far ahead. My opponent never lost his smile, it was clear he enjoyed the game even if he wasn’t very good at it yet. I nominated him for the sportsmanship award and he would have won it if he hadn’t left before the prizes were given out. Won. 100 points destroyed, 0 lost. Game two was against the guy who ran the Falcon/Outrider combo in the Escalation tournament. He was playing a hard-hitting list of glass cannons with a damage sponge. Keyan Farlander had Opportunist and a Heavy Laser Cannon. Ibtisam had something similar and there was a Biggs on the board to soak up shots. I didn’t waste any time and focused fire on Biggs, removing him in the first round of firing. The next few rounds saw me in a better position to remove Ibtisam due to some bumps so I focused on her even though Keyan was the bigger threat and wiped her from the board quickly. Keyan didn’t last much longer but I opted to bump my ships into one another instead of take actions the last two rounds because Boba was going to go over an asteroid and Kath was firing her booty cannon. The sick thing is that Kath still got a target lock every round from the K4. I won without losing a ship but if things had gone on much longer I would have been in rough straights. Game three was a nail biter. I came up against a guy running a list I had considered myself: a Decimator and the 35 point Soontir Fel. The Rear Admiral had Darth Vader; I focused on him and got him down to a single hull point. He fired at Boba, stripping the last shield and decided to commit suicide with Vader to inflict a crit. It was awesome. That left me with two ships against a nigh-impossible to kill Soontir Fel. Boba was moving after Fel so I managed to use my Inertial Dampeners at the right moment stay at range 2 of Fel and double-stress him. With no tokens the next turn, I was able to get a damage through and turn off Stealth Device. Boba then got ahead of Fel and started firing out the rear arc. Once Boba was leading Fel and keeping him double-stressed so Fel couldn’t take actions, it was inevitable. Won. 100 points destroyed, 48 lost. At this point I had the highest MOV on the field with 551. The next game was a doozy. It came down to the wire but I lost. My opponent went on to win the tournament and it was an incredibly close game so I can’t be mad. The enemy flew Han with Gunner, Veteran Instincts, C-3PO, and the Millennium Falcon title with two naked Blue Squadron B-Wings as support. I knew that the key to me winning would be to clear the B-Wings as quickly as possible. They don’t have the staying power of the Falcon but they could easily do as much damage. I focused fire and worked my positioning. Boba was able to put stress on a B-Wing in the opening joust by firing at range 2; I had a range 1 shot at the other B-Wing but I wanted to stress one so I could control movement. Kath finished off the shields on the stressed B-Wing. The next round my opponent tried to K-turn with the not-stressed B-Wing and bumped Boba. The Falcon bumped Boba and then Boba bumped the B-Wing. Neither ship can fire at Boba and the B-Wing was facing the wrong way to shoot Kath, who got behind the B-Wings. Boba wiped the previously stressed B-Wing (three enemy ships at range 1 meant I rolled 4 dice and could reroll 3 of them without taking an action!) but Kath just barely didn’t have arc on the remaining one. That turn meant I removed a third of my opponent’s damage potential, another third was stressed while pointed the wrong way, and the final third, my primary target, was running away. This was very good for me. My opponent saw things were not going according to plan and bugged out with the Falcon the next turn. Kath made a K-turn to re-orient while Boba did a hard to to put the B-Wing behind him. The Firesprays fired on the B-Wing and scored some hits. Next turn the B-Wing K-turns again; Kath does her crazy target lock, focus, evade shenanigans; Boba K-turns; and the Falcon wound up on an asteroid well out of range. Concentrated fire from my ships took out the second B-Wing. At this point I’m feeling decent, even though the Falcon has only lost a shield due to the asteroid. It takes a few turns to close with the Falcon. Fire streams forth from the Firesprays, using the “Mangler” Cannon at range 3 to do my best to regulate how much damage the Falcon can block. The Falcon quickly drops down down into hull. Justin started by playing C-3PO very conservatively and always guessing zero. It’s the smart play, he’s guaranteed one evade if he does that. Once I start chewing into his hull and dealing some critical hits he started gambling – guessing 1, which means he gets nothing 5/8 of the time and 2 evades if he rolls one – and it paid off the three times he did. He manages to kill Boba Fett and it comes down to Kath vs. Han. I’m doing my best to regulate the amount of damage the Falcon is doing and opt a few times to take one damage rather than spend an evade token and let the Falcon get another attack with Gunner. We got down to a single hull on each ship and Kath skips over an asteroid because I had placed myself too close to one the round before in an attempt to kill the Falcon but didn’t get all the hits I needed. No damage from the asteroid but I’m unable to take actions so I eat one hit when Han shoots first. Lost. 44 points destroyed, 100 points lost. This was one of the best games of X-Wing I have ever played. Justin, my opponent, congratulated me on a hell of a game and later told me, “I kept waiting for you to make a mistake, give me an opening and you just never did it.” That’s a high compliment from the guy who won the tourney. He flew really well. About his only mistake was bumping with that B-Wing’s K-turn. Even his gambles paid off so I can’t fault the choice to gamble. I would have played it conservatively with C-3PO but if he had done that, he would have lost. The game could really go either way. Taking out the B-Wings so quickly was a blessing. Each one only got a single shot off. I should have slow rolled up to the Falcon once it was two on one and tried to get Kath in front of it. Not only could I then block the Falcon to prevent its actions but I could also fire out the booty cannon if they don’t bump. Honestly, I just want a rematch. Justin was a great player and it was an incredible game. In my last game I faced off against a pair of Aggressors running the IG-2000 title. My opponent had started off going 3-0 like I did but lost his fourth game, which is why we got paired. I think he was running IG-88B and IG-88C, both with Ion Cannons, Autoblaster Cannons, Autothrusters, and some other stuff. This game just wasn’t fair. I knew how to fly my ships better than my opponent and I got to move after, shoot before he did. I took out an Aggressor in two rounds of firing, which just isn’t supposed to happen to a ship with 4 hull, 4 shields, and 3 agility running Autothrusters, but he got trapped between my ships and ground into dust. From there it was a mopping up action. I ended the game with shields on both ships and more than thirty minutes on the timer. One thing that I think had a mental effect on my opponent is that Autothrusters did nothing for him this game. I closed to range 2 and firing out my rear arc doesn’t trigger Autothrusters because it’s an arc. My opponent kept trying to flip a blank into an evade and I had to remind him that I had him in arc. He clearly wasn’t happy with that and we even had the TO (and both tables next to us) confirm that the rear arc counts as an arc for these game effects. He was demoralized after that was made apparent. Win. 100 points destroyed, 0 lost. That final win brought me to a tournament score of 20 (out of a possible 25) with an MOV of 796. By both measures I was in second place behind Justin and apparently gave him the hardest fight of the tournament. Though I was spoiling for a rematch, the tournament ended without a cut. In addition to alt-art Tycho Celchu and Push the Limit cards, I won a medal from the Spring 2015 tournament kit. Mostly my lesson from this tournament is to not sell myself short. I flew my heart out here and played some impressive games. Earning a second place finish and being so close to the champion’s table was exhilarating. My tactical and strategic choices were sound throughout. Boba/Kath is an effective list that’s competitive as long as I set up well and keep my objectives straight. Target priority is a big thing here. Running two ships means I need to select and eliminate the most dangerous opponent in short order. Whittling down opponents into the same number or fewer ships is key. Thankfully the Firespray has the durability to do that against most lists. Another thing I learned is that the Engine Upgrade wasn’t as useful on Boba Fett as I had hoped. I may drop it in favor of a Heavy Laser Cannon on Kath Scarlet. Having four dice at every range (except range 1 out the rear arc, which is 5) would help her put through damage on the enemy. Combined with her action economy, this could be very, very potent, indeed. It may just make Kath more of a target than she already is. That may not matter as all my opponents seemed to focus on Boba as the main threat; in my opinion, he wasn’t. Keeping Veteran Instincts on Boba may be worth it if only to force enemy Soontir Fels to fly differently, though the threat of Boba going after Fel is significantly reduced if Boba cannot reposition. Expert Handling is a cheaper way to re-position but it comes at a significant cost – not only is it an action, it gives me a stress and Fel moves after Boba. Another way to go is to leave the Mangler on Kath but give Boba an Autoblaster cannon. This is a more aggressive build that has me pushing in with Boba to kill the enemy, since hits from an Autoblaster can’t be canceled. It’s some re-positioning Interceptor tech. A good roll could simply remove an Interceptor from the board with nothing the opposing player can do. Things to ponder and play test. Escalation started at eleven Thursday morning. It’s a variant tournament structure with an emphasis on squad building. As I said yesterday, a normal game of X-Wing uses 100 point squads. Escalation begins with a 60 point squad and then adds 30 points in the successive three rounds of play. You have to keep all the ships and upgrades from previous rounds but you can spend points to add new ships and upgrade ships you took in previous rounds. My list was simple: it starts with two ships and adds a ship every round thereafter. I based my list around the popular 35 point Soontir Fel because he’s an alpha-level predator. To round out my first round list, I brought a classic Doom Shuttle for another 24 points and kept a point as a bid to control initiative. The initiative bid is important because I want Soontir going absolutely last for positioning. In case my opponent has a pilot skill 9 ship, I can hand initiative off so Soontir moves after the opponent. I can then reposition Soontir based on my opponent’s position on the board. Each round I added a Royal Guard TIE Interceptor with the same upgrades as Soontir: Push the Limit, Autothrusters, Royal Guard TIE title, and Stealth Device. This made four of my five ships 4 Agility, 3 Attack ships that are insanely nimble, can take focus + evade every turn, and while at range 3 or outside the attacker’s arc a blank on defense gets turned into an evade. The Royal Guards were 30 points each so I was able to keep an initiative bid every round. It proved important a few times. The first round was the single most lopsided game of X-Wing I have ever played. It just so happened that my opponent was the one person to bring the one list I literally could not beat in this format. I forget what all the upgrades were but the important thing is that my opponent was running a Decimator crewed by Darth Vader and could basically win in three rounds without trying. Darth Vader is a really interesting card. As Imperial only crew, he can only fit on the Firespray-31, the Lambda-class shuttle (like the one in my list), the TIE Phantom, and the Decimator. Vader’s ability reads, “After you perform an attack against an enemy ship, you may suffer 2 damage to cause that ship to suffer 1 critical damage.” It’s a powerful but situational ability. That’s the sweet spot for cards in X-Wing. You don’t want something that’s so good everyone takes it. No one puts Vader on the Phantom or the Firespray-31 because the Phantom is too squishy (only 2 shields and 2 hull) and the Firespray-31 is better as a tank that sticks around to hammer your opponents. That leaves the shuttle, as I did, and the Decimator. The Decimator is a good choice because it has a 360-degree turret. As long as a ship is in range, the Decimator can give it a crit with Vader. And, let me tell you, range 3 on a turret is a LOT of space on the board. Most people don’t put Vader on the Decimator in Escalation because he’s really only useful in the first or second round. Once people start getting more ships on the board there aren’t enough opportunities to use his ability. Decimators die very quickly against swarms of ships because they have zero agility dice. What made the matchup into my own personal Kobayashi Maru is that my foe didn’t even need to hit Soontir to kill me. All my opponent needed to do was declare three attacks against Soontir. Vader doesn’t require you to hit your target. Hell, I could have hit him with a Blinded Pilot critical where the ship rolls zero dice for an attack and he’d still put a crit through with Vader. This makes Interceptors, with their lack of shields, particularly vulnerable to Vader’s crits. My only hope was to get enough damage in five shots (Soontir, Shuttle, Soontir, Shuttle, Soontir) at the Decimator that my opponent couldn’t use Vader without blowing himself up and losing the match. Yeah, that didn’t happen. The first critical my opponent Vadered onto Soontir turned my elite pilot into a pilot skill 9 generic pilot. Two more crits collowed and Soontir was done. To my credit, he never once hit Soontir with an attack. Vader just Force-crushed the ship. Once Soontir was gone there was nothing I could do to keep the Decimator in the shuttle’s arc because the Decimator so much more maneuverable. It was all over very quick. Lesson learned: big turret ships rule the 60 point round of Escalation. Lost. 0 points destroyed, 60 lost. The second round went much better. My opponent was running some wacky list using B-Wings with Enhanced Scopes. The shuttle died pretty early but there was just nothing my opponent could do to keep my two Interceptors in arc. Win. 90 points destroyed, 24 lost. Round three was a lot of fun. My opponent had a “Fat Han” Millennium Falcon (Han Solo with C-3PO, R2-D2, and Engine Upgrade with a 3 or 4 point elite pilot talent upgrade) and a base YT-2400 with the Outrider title and a “Mangler” Cannon. There was another ship in the list but I can’t remember what it was. Maybe a B-Wing? My list was designed specifically to counter turrets with three attack dice. There wasn’t much my opponent could do to touch me. I had more dice on defense than he had on attack and I outnumbered him. Fat Han just takes a damn long time to whittle down. My opponent did manage to squeak a damage in on Soontir to turn off Stealth Device but the other two Interceptors were untouched. The shuttle died early, of course, but it did its job as a distraction and blocker. Win. 120 points destroyed, 24 lost. The last round was against a really interesting list. It had two B-Wings and two A-Wings supporting a heavily upgraded Chewbacca in the Millennium Falcon. The A-Wings were running Assault Missiles. This was the only round other than the opening in which I lost an Interceptor. An A-Wing target locked a Royal Guard and I just barely didn’t manage to get into range 1. He attacked with Assault Missiles and got through my four defense dice. The good news is that one of his B-Wings took damage from the Assault Missile splash. A range 1 shot from a B-Wing later and I was down to three Interceptors. Surprisingly, my opponent didn’t kill the shuttle. Another full win on dice. Win. 150 points destroyed, 30 lost. All in all, despite my atrocious opening, I finished third in the tournament. My margin of victory (MOV) was very high because I killed my opponents’ 90, 120, and 150 point lists entirely while only giving up 24, 24, and 30 points. The guy who lost at the top table in round 4 dropped to fifth place because he lost 150 points. Ouch. My prizes that day were an alt-art Push the Limit card and an Adepticon 2015 X-Wing Escalation acrylic range ruler. It’s now the one I keep in my X-Wing kit for play. If you want to survive in Escalation and make it to the top table, you have to bring something that can take a beating. I think there are two kinds of lists that will do well in the opening round without limiting themselves too much later or leaving themselves open to Vader shenanigans early. The first is a swarm. Either five TIES or Z-95s or 4 with an elite pilot could work. A swarm is a good base on which to start. “Howlrunner” with three Academy Pilots is a solid mini-swarm. It should be able to stand up to a Decimator just fine but it may struggle with a Fat Han. For a Rebel swarm I like Airen Cracken backed by three Bandit Squadron Pilots. Giving Cracken Cluster Missiles allows his special ability to trigger twice in one round and leaves you with a one-point initiative bid. My problem here is what do I upgrade with? I like fast, maneuverable ships with three attack dice. (Yes, I’m in love with the TIE Interceptor and you will never convince me it’s wrong.) B-Wings are a good choice, I guess, if you upgrade them. I personally don’t think Scum do very well as a swarm (maybe it’s because I just don’t fly swarms well) but I’d be tempted to start with Kavil running Veteran Instincts, Engine Upgrade, Unhinged Astromech, and Autoblaster Turret at 32 points. That would give you someone to hunt down Soontir Fel or Corran Horn with irresistible damage. Maybe add a 26 point Tansarii Point Veteran (“Heavy Scyk” Interceptor title, Heavy Laser Cannon) to that for the first round. Second round add another TPV but upgrade both to have Push the Limit. Third and fourth round add another 29 point TPV. That’s a lot of firepower on the board. Should be able to punch through a lot of things if they target lock and focus when they’re out of arc then turtle with focus and evade while in arc. 148 points. Seems like it might be good. The second thing that can stand up and take a beating in the first round is a turret. Fat Han and the Decimator are the clear choices here, though a Fat Dash is certainly viable. If I were to go Imperials again, I’d do a 59 or 60 point Decimator in the first round then upgrade with 30 point Royal Guard Pilots just like I did in this tournament. I like Rear Admiral Chiraneau, who is pilot skill 8, with Expose and Experimental Interface crewed with Rebel Captive and Ysanne Isard. While Commander Kenkirk is cheaper and more durable, I like Chiraneau’s ability to be more consistent when dealing damage. In the opening rounds, target lock as an action to trigger Experimental Interface to use Expose. That gives me a 4 dice turret for effectively no cost. Once shields are stripped, target lock as an action and wait to use Expose until Ysanne Isard’s free evade action in the combat round. If I already have a target lock on my intended target, I can focus instead. Another thing I learned is just how good an Interceptor with Push the Limit, Royal Guard TIE, Autothrusters, and Stealth Device is. Not counting the Vader shenanigans in the opening round, the nine Interceptors I flew in the tournament took a grand total of five damage. Sustained fire from high attack value ships will get through but if I have actions they’re damn near impossible to damage with three attack dice. Adepticon is a local convention focused on wargames. It’s been around since 2003 and has grown significantly. This was my first year attending and the convention’s first year in a larger space. The play hall seemed to me to be about half the size of GenCon’s vendor hall – which is to say still enormous. An impressive number of games were being played and demoed. Standards like 40k, Flames of War, Malifaux, and Warmachine/Hordes were definitely popular but quite a few of the games were completely new to me. Wild West Exodus is a sci-fi/western/Reconstruction-era mashup with a great theme and incredible miniatures. Freeblades has Viking pirates and how can you not love that? Many, many more games were there. Too many for me to keep track of. I went to Adepticon to play X-Wing. There were three tournaments, one each day on Thursday through Saturday, in three different formats. Each tournament had prize support. Players could earn up to three copies of an alt-art Push the Limit if they placed high enough. Adepticon had acrylic range rulers made for the top four of each tournament that say Adepticon 2015 and the tournament name. Fantasy Flight Games also provided us with a Spring 2015 tournament kit for the first two tournaments. There were some random drawings for swag, the biggest prize being an X-Wing pilot’s helmet that’s approved costuming by the Rebel Legion. Thursday was the Escalation tournament. I really enjoyed the format because it presents an interesting challenge for squad building. A normal game of X-Wing uses 100 point squads. Escalation begins with a 60 point squad and then adds 30 points in the successive three rounds of play. You have to keep all the ships and upgrades from previous rounds but you can spend points to upgrade ships you took in previous rounds. Friday was a standard dogfight tournament with five rounds at 100 points. Saturday was a team deathmatch tournament. Each team had a 150 point cap and both team members had to have between 70 and 80 points. Unfortunately, the decision to go to Adepticon was late on my end so I didn’t have a team mate for the team deathmatch. Instead I played the first ever Imperial Assault tournament hosted by Fantasy Flight Games. When I wasn’t playing X-Wing or Imperial Assault, I was talking about those games with the other players. The tournaments took enough of my time that I didn’t really have an opportunity to wander around to see other games. The Saturday events ended a bit early so I walked the vendor hall with some friends to look at all the cool minis games we weren’t going to buy. I had a good time and I’m considering adding Adepticon to my schedule for next year. The draw for me is that I go there to play games – there aren’t panels or industry events or other things to distract me. I show up and I play nine games of X-Wing in two days. 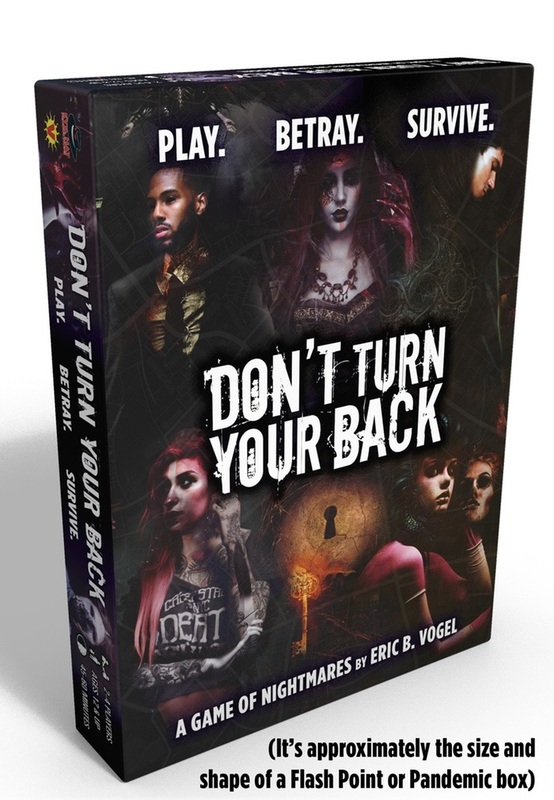 I was lucky enough to get a preview copy of Don’t Turn Your Back, the third board game being published by Evil Hat Productions. It’s currently on Kickstarter with a week or so to go as of this writing. Don’t Turn Your Back is a combination deck building card game and worker placement board game where the cards in your deck act as the meeples you place on the board. The theme is that of Fred Hicks’ RPG Don’t Rest Your Head – insomniacs who find themselves on the brink of insanity in the Mad City, a macabre world where dreams have power. Eric B. Vogel, the designer for Zeppelin Attack, returns to Evil Hat with another lean deck builder.